When we last saw the Civil War, the 121st edition for football, Oregon left the field with the biggest win in the long history of the rivalry. 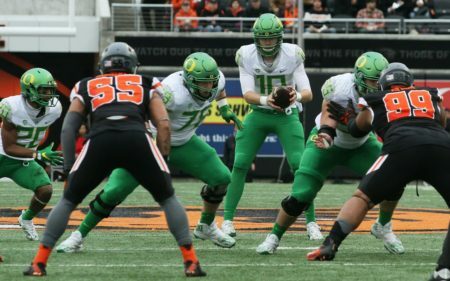 The Ducks exited Autzen Stadium last November with a 69-10 win to gain a bit of revenge over the previous season’s game where the team was in shambles. To their credit, the Beavers took advantage to ease on the decade-long dominance by their rival from Eugene. At the time, Oregon State thought its first win in the series since 2006 was going to propel it to a great season the following year. Instead, the wheels came off with Gary Anderson leaving mid-season resulting in an historically bad defense which Justin Herbert exploited time and time again. Oregon assumed that win would also propel it to a good bowl game experience and to a great 2018. But coach Willie Taggart bolted for Florida State before the Vegas Bowl, leaving the program’s future in doubt. The Ducks hired Mario Cristobal and he has calmed the waters with some impressive recruiting and even though this season has been up and down, Oregon’s year has been a successful one as the Civil War looms. Although last year’s game was a rout, there was still an initiation for then offensive coordinator Cristobal to the Civil War. “I learned the intensity of it,” he said of the rivalry. “I know it was an intense deal the year before in Corvallis and it carried over to last year’s game. Let’s just say I’ve always loved and been used to great rivalries and this one did not disappoint. In fact, it exceeded expectations. Oregon State, even with a 2-9 record entering the game, seemed to have also calmed things down with the hiring of OSU alum Jonathan Smith. The former Beaver quarterback entered Corvallis knowing he had a major rebuilding on his hands, but the team is already showing some of traits of being an overachiever who doesn’t give up until the clock hits zeros. The Beavers were down 31-3 after the Buffaloes began the third quarter with a 75-yard touchdown run. After that, Oregon State outscored Colorado 24-3 in the fourth quarter and won 41-34 in overtime. That home loss was Colorado’s third straight at the time and the Buffaloes still haven’t won again. Oregon State haven’t won since, however. What they do have is a freshman running back and a senior quarterback capable of causing the Oregon defense fits if they aren’t prepared. Jefferson is second in the Pac-12 with 1,316 yards (119.6 ypg) and leads the conference with 12 scores on the ground. The 5-10, 211-pounder from Harbor City, Calif. has a good chance of being the Pac-12 Offensive Freshman of the Year. Handing the ball to Jefferson is quarterback Jake Luton, who has had an injury-riddled career, but when the 6-7 signal caller is healthy, which he is now, he is a dangerous pass-thrower. Luton isn’t going to run the ball at 230 pounds as he is a traditional pocket passer. Oregon State has allowed 46 sacks, but not on Luton. He has played in just seven games and has thrown eight touchdowns with just two interceptions. A key to the game, as with many of these Civil Wars, is the weather, which could determine the outcome. 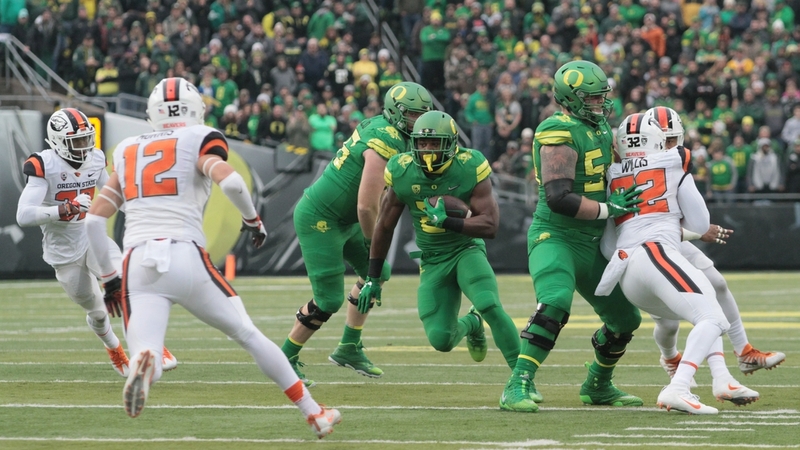 Oregon is a 17.5-point favorite, but the wind and the rain might be the equalizer.